You are currently browsing the tag archive for the ‘leaf peepers’ tag. The colors are coming on fast and furious. Every day it seems that there is more and more color in the mountains. There is serious doubt around our house that there will be any leaves really left on the trees for the leaf peepers that arrive on Columbus Day weekend. In fact, taking a look of the wind blowing around today any of those leaves that have already turned are dropping at a high rate of speed from the trees. The best place for foliage in Vermont as voted by Yankee Magazine has also been recently voted (by none other than The Ts themselves) to be the place to avoid the most come foliage season. 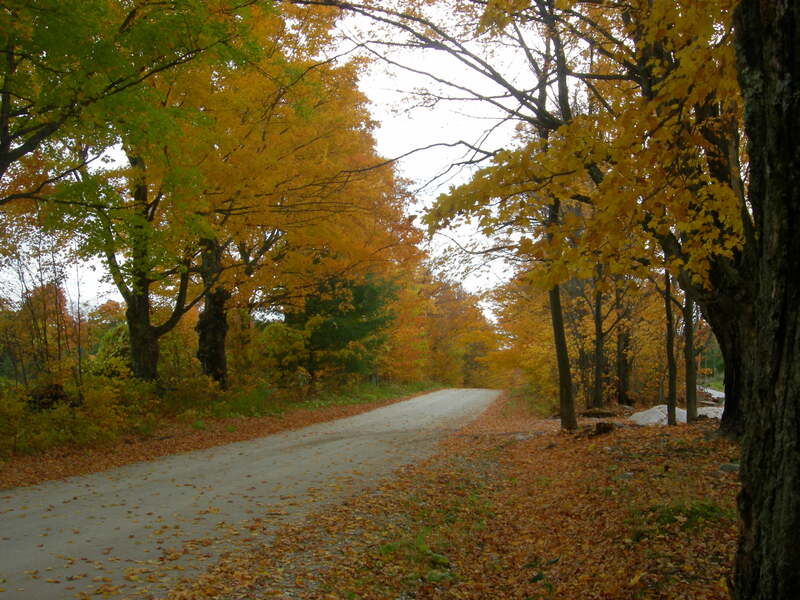 Yankee Magazine has voted Manchester, Vermont, the #1 place in Vermont for fall foliage. Manchester came in #3 overall behind Connecticut and Maine (which has some people in Vermont scratching their heads- but that’s another story). Manchester is a nice town, great shopping, great restaurants, an awesome bookstore – but it is always filled with people. Now, come foliage season, I am sure that it will be EVEN MORE filled with people (if that is even possible) They will come, from far and wide, to see the foliage and shop and eat. All of this is a very good reason to completely avoid Manchester (or avoid it as much as humanly possible) for anyone who actually lives around here. We have trees here, we have foliage – I certainly do not need to jump in the car and drive about 1/2 hour south of us to Manchester to see their foliage. And anyone who knows me personally knows that outlet shopping is not even on my list, much less my top ten list, so that too I can forego. The only thing that will make me sad is avoiding Northshire Bookstore, which is my favorite bookstore ever. Lucky for them (unlucky for us local folk) Yankee Magazine mentions them by name as a “must see” while you’re in Manchester checking out all those trees and shopping. Therefore, that means that even the bookstore will be off-limits due to throngs of those people (as the Maine folk would say – “from away”) that will be invading the town and the bookstore during foliage season. Well, I guess that between now and then we’ll have to get our fill in order to last us through that season affectionately called Leaf Peeper season. FYI, the photo is our own fall foliage from last year. This is what our forecast looks like for the next couple days. Seems Mother Nature let the leaf peepers have their weekend and now…..snow. Sunday was actually a sunny day. It was the first that we have had in a while. The first day that it actually didn’t rain, even a little, at some point during daylight hours. It gave the peepers a chance to get a good look at the leaves some traveled pretty darn far to see, without having to be bundled up in layers of plastic and gortex to keep from getting drowned. All around us these days the mountains are exploding with colors – foliage is definitely at its best, but come on people, be careful where you just stop on the side of the highways to take pictures. Even the animals enjoyed the warm, sunny day. Here, Skye and Phoenix catch some rays while they take in the foliage and think – mmmmm – leaves and apples, life is good. Here’s what it looked like in the mountains and yard around the T’s House this morning for any of you thinking about taking a ride this weekend to check out the foliage. The mountains are sporting some color after the week of cold weather, snow, rain and frost. Slowly, but surely, the colors are coming on this first full day of Autumn. The weather is surprisingly warm and rather humid. A big change from earlier in the week when it was evenings of freeze warnings for here on the hill. Here are pictures from outside our door. In two days, not much has really changed around here. We are supposed to be getting some cool nights in the next few days, so I am sure that the cool temperatures will have an impact. The mountains are starting to take on a definite twinge of color. There is the occasional tree that has completely exploded into yellow or orange or red. While it is not quite time to go leaf peeping, it is coming soon. 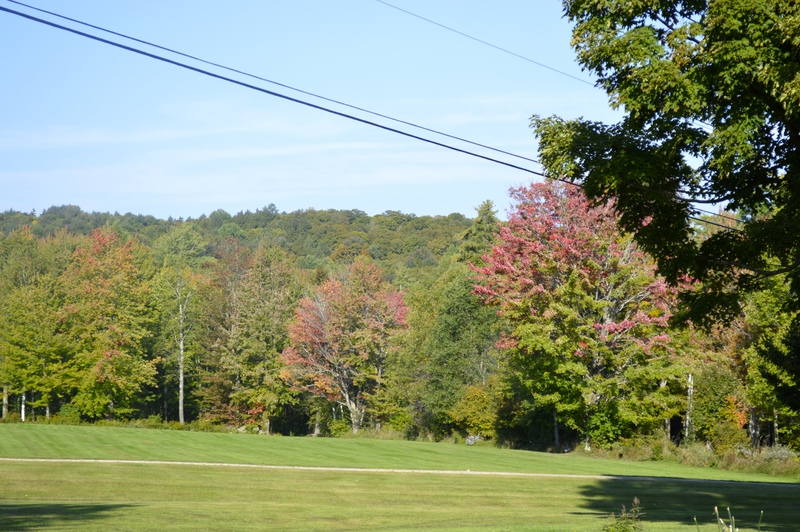 For those of you who are not able to look out your windows and personally keep tabs on the foliage up here in Vermont but might be planning a trip or waiting for it to be “just right” for that trip – I thought that I would do a daily Foliage update. See, there isn’t too much color around here, but when it goes, it will go fast. So…be prepared.